Alyssa Holguin, 16, of Buckeye, Arizona, is fighting a rare disease while inspiring others to never give up. Alyssa was diagnosed with Rett syndrome when she was 3 years old. Rett syndrome is a genetic neurological disorder that typically becomes apparent after 6 to 18 months of age in females. It is brought about by a single gene mutating along the X chromosome, which is why it is almost always girls that get it. This disease seriously impacts a child’s ability to physically function. It usually causes problems with coordination, speaking, and walking. Complications can include seizures, scoliosis, and sleeping problems. Rett syndrome is commonly described as bringing together the symptoms of autism, cerebral palsy, Parkinson’s, epilepsy and anxiety disorder, all rolled into one. Although Alyssa cannot walk or talk, that doesn’t stop her from smiling and laughing. Alyssa loves Disney movies, especially Lilo & Stitch, and all things Disney-related. 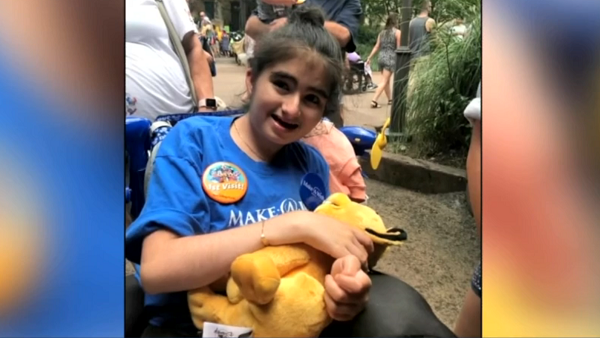 The Make-a-Wish Foundation gave her a trip to Disneyland. Alyssa is homeschooled by her mom, Kris, who told AZFamily.com that her daughter is alert and aware of everything that’s going around her. But her body can’t react to what her brain is telling her to do, almost like being paralyzed. Despite her physical condition, Alyssa still has the mind of a 16-year old. A high-tech Tobii Dynavox device helps Alyssa communicate by letting her use her eyes like a computer mouse. Alyssa is very active and determined to reach her goals by going to occupational therapy, physical therapy, horse therapy, and other social and learning groups weekly. Physical therapist Ashley Wheeler said that she and Alyssa formed a special bond during their sessions. Alyssa’s attitude inspired Wheeler to work on getting healthier herself, so she could be a better physical therapist for her patient. “I started running because of Alyssa,” said Wheeler, who has since lost 60 pounds. “She completely changed my life for the better,” Wheeler explained. While talking with Alyssa’s mom during therapy sessions, Wheeler realized that Alyssa would probably like “running” too. The two women came up with a plan to sign Alyssa up for her first half-marathon at Disneyland next year. Wheeler will be the one pushing her wheelchair. However, the daily wheelchair that she uses now won’t work for a race that lasts several hours. They need help raising between $5,000 and $7,000 for a racing wheelchair since it’s not covered by insurance. 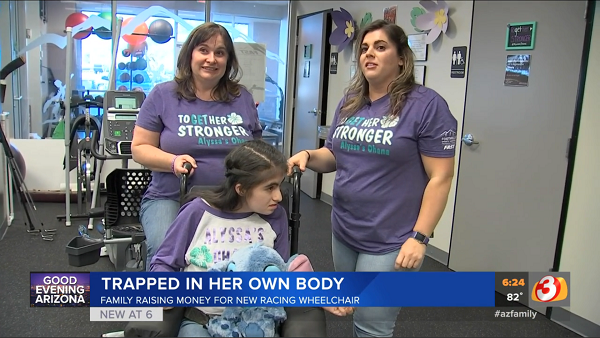 A racing wheelchair helps the person pushing the wheelchair navigate better, while the design also helps the patient sit more comfortably with better posture. Kris said it’s not just about the chair, it’s about the cure. With Alyssa “running” in the marathon, they will also be bringing awareness to Rett syndrome. “Once we do a chair, we’re hoping to raise money for Rett research,” explained Kris who wants to provide hope for Alyssa and other girls like Alyssa, and make a difference in their lives. They named the fundraising drive “Alyssa’s Ohana.” The word ‘ohana means “family” in the Hawaiian language, but in a much wider sense, more like an extended family. It’s a key theme from Disney’s Lilo & Stitch. The concept of ‘ohana includes not only one’s relatives, but also one’s friends and neighbors—just like Alyssa is loved by her family, friends, and all of her therapists. The Holguin family has reached over half of their goal so far. They raised $320 through a Custom Ink Fundraising Campaign. They have also set up a GoFundMe account. In 2007, scientists were successfully able to reverse Rett syndrome symptoms through gene therapy in a mouse and will hopefully begin human gene therapy trials in early 2019. Please consider joining Alyssa’s Ohana. Together we can fight for her and fight for a cure.